On Jan. 31—the day after President Trump's State of the Union address which lauded "beautiful clean coal" and completely ignored climate change—environmental activists gathered in Washington, DC to launch a new campaign to combat fossil fuel development and drive forward a renewable energy revolution from the ground up. 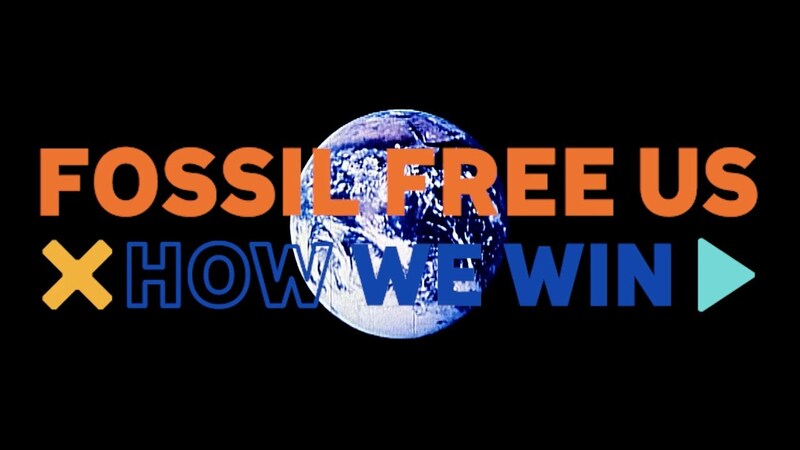 "Fossil Free U.S." is a grassroots strategy for passing local resolutions in cities and states nationwide that ban new fossil fuel projects. As a press release for the campaign stated, "Stopping Trump's climate-wrecking plans won't come from the beltway, but from communities everywhere fighting for justice from the ground up." 350.org co-founder Bill McKibben said, "2017 was tough—we resisted, but we lost a lot of ground. 2018 we take that ground back, and we'll do it with this Fossil Free campaign that helps unite progressive environmentalists to move us off oil and coal and gas and on to a world that works." The 350.org-hosted event was held at George Washington University and broadcast live to more than 300 watch parties around the country. It featured a number of prominent climate advocates, including Sen. Bernie Sanders of Vermont. "Donald Trump spoke last night for over an hour. He talked about many things, but somehow he forgot to mention the words 'climate change.' What an outrage. But we should not be surprised, because Donald Trump―one of the great scientists of our time―has determined, after years and years of exhaustive study, that climate change is a hoax brought to us from China," Sanders quipped to a cheering crowd. "But not only does he not talk about climate change, but horrifically and dangerously, has as appointed administrators of the EPA and the Department of Energy who are doing everything they can to stop the movement towards sustainable energy," the senator continued. "What we are about is telling Donald Trump and the Koch brothers, and all of these people, that their days are numbered, fossil fuels' days are numbered, we are going to transform our energy system." Sanders once again committed to refuse campaign contributions from the fossil fuel industry and called on other politicians to do the same. Charles and David Koch, the billionaire brothers who own the coal, oil and gas conglomerate Koch Industries, plan to spend a record $400 million for the midterm elections. Other speakers included Cherri Foytlin, Rev. Lennox Yearwood Jr., Antonique Smith, Naomi Klein, Jacqueline Patterson and New York City Mayor Bill de Blasio. According to HuffPo, the event highlighted cities' efforts to combat fossil fuels, including New York City's plans to divest its $5 billion in pension funds from fossil fuel investments and its lawsuit against five oil giants for their role in contributing to the climate crisis. "Big oil may think they are living in Trump's America," de Blasio said. "They are wrong. They are living in your America." "The first—joining in work pioneered by groups like the Sierra Club—is to persuade towns, cities, counties, and states to pledge to make the transition to 100 percent renewable energy. This is now easy and affordable enough that it doesn't scare politicians—cities from San Diego to Atlanta have joined in, and they will help maintain the momentum towards clean energy that the Trump administration is trying so hard to blunt. "Job two is to block new fossil fuel infrastructure. In some places, that will be by law: Portland, Oregon, recently passed a bill banning new pipes and such, over the strenuous objections of the industry. In other places it will take bodies—tens of thousands have already pledged to journey to the upper midwest if and when TransCanada decides to build out the Keystone XL pipeline that Trump has permitted. "And third is to cut off the money that fuels this industry—by divestment, which has now begun to take a real and telling toll ($6tn worth of endowments and portfolios have joined the fight, and studies show it is cutting the capital companies need to keep exploring for oil we don't), and by the kinds of lawsuits that New York, San Francisco and a host of other cities have already filed." Find more details about the campaign here.